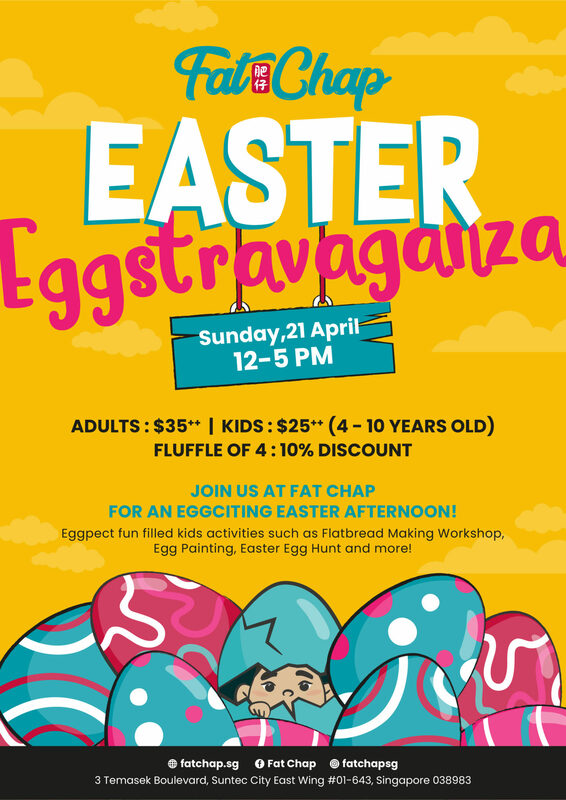 Gather the kids, grabs those Easter baskets and prepare for the hunt at Fat Chap’s first ever kids Easter Eggstravaganza. Happening on Sunday, 21 April 2019, enjoy an afternoon of workshops, games, and food with the little ones. Bring out the creative chef in your kids with Flatbread Making Workshops hosted by Fat Chap’s charismatic head chef, Selamat Susanto. Be it sweet or savoury flatbreads, there is sure to be a topping that suits every fussy eater. Other activities include Egg Painting booths to get those little fingers dirty, as well as a Cotton Candy and Popcorn stand. Kids get to partake in a mini Easter Egg Hunt, and lucky ones stand a chance to win goodie bags! Fill your tummies at the buffet line showcasing Easter-themed delights which are inspired by Asian street food and traditional comforts. Feast on Ramen egg on Crispy Potato Nest, Balinese Pork Ribs, as well as sweet treats like Carrot Cake, Bunny-shaped Cookies and Easter Egg Mini Cheesecakes.